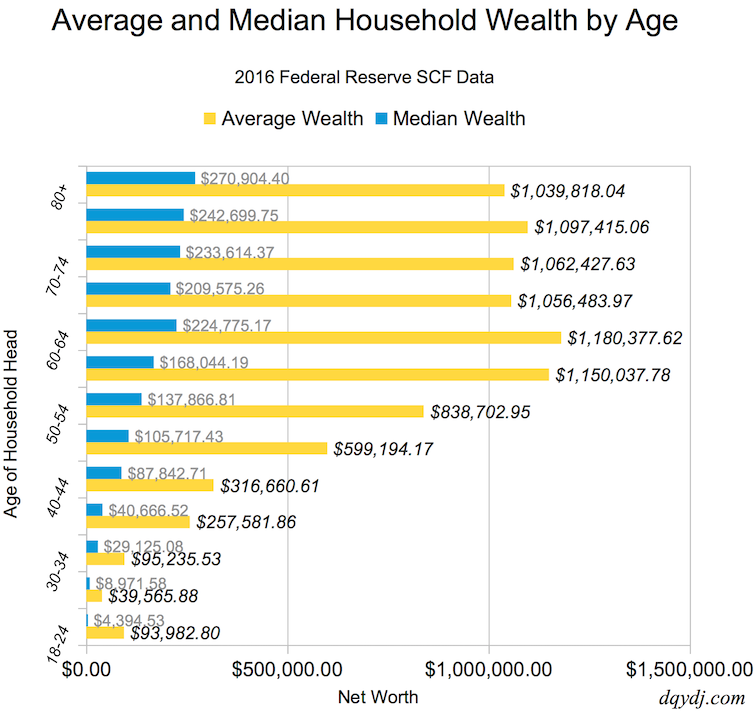 This page contains a net worth by age percentile calculator for the United States in 2016 (newest data as of in 2019). Enter net worth and the age of a household primary earner for a net worth percentile estimate, down to the closest 1%. Also: try our individual income by age calculator and individual income calculator. For net worth, try the overview of net worth brackets or the net worth percentile calculator (ignoring age). Net worth is the most important number in personal finance. Net worth is your value today assuming you sold everything and paid off all your debts. Crossing your net worth with age is even better – it’s a running tally of how you’ve saved, budgeted, and invested over a career. To calculate your net worth, first add up the dollar value of all of your assets. That includes your home, car, all bank accounts, brokerage accounts, retirement accounts, and other things of value. Next, subtract the sum of all of your debts. This category includes your mortgage, credit card debts, student loans, personal loans, and everywhere else you owe money. That final number is your net worth. With your net worth and age, you can compare your performance with the average, median, and other wealth percentiles on this page. Want an easier way? Personal Capital calculates and tracks your net worth over time, and you can compare to others by age, net worth, or budget. They also provide investing advice so you can get the most from your investments – and they also help you eliminate fees and reduce spending. Average and Median Net Worth by Age Range, 2016. Includes home equity. Below we’ve calculated the median and average net worth for all ages in the United States. We made two calculations: one for net worth including a house, and one without. Average net worth ranges from $93,982.80 for 18-24 year olds to $316,660.61 all the way up to $1,180,377.62 for 60-64 year olds. (Even though we ran numbers both ways, you should include your primary residence in your net worth calculation). For past comparisons, check out our archived calculator for 2013. Net worth is the primary way investors become Accredited Investors. These investors can access special investments – hedge funds, venture capital, private equity, and other investments and placements such as franchises. Our estimates of Accredited Investors by age vary between .52% of households headed by a 25-29 year old up to 16.5% for 80+ years old. Want more? See our post on the number of accredited investors in America. Data comes from the 2016 Federal Reserve SCF, first released in September, 2017. For a full discussion on our net worth methodology, see our net worth brackets page. The net worth percentile calculator discusses valuing primary home equity. As an important note, remember that we’re looking at discrete households here. Especially for younger individuals, if an adult is living in another home their net worth is rolled up with the primary earner. We are also in debt to Anthony Damico and his online R analysis booklet ASDFree. It makes SCF analysis much smoother – please check it out if you’re interested in running these calculations yourself. Where is the 2019 Net Worth by Age Calculator? Unfortunately, the SCF is currently only conducted on a three year cadence. We expect to add 2019 net worth data near the end of 2020. Due to popular demand, we shifted the age range breakdown from the 2013 Age Percentile Calculator. We now include 13 age ranges, carefully selected to shine a better light on (common) retirement brackets. Note that our divisions are finer than the Fed’s choices, some of these brackets are relatively sparse in data points. Especially when looking at the lowest and highest percentages, keep the uncertainty in mind. Why Care About Net Worth By Age? Older people heading households are more likely to have spouses. Age is a reasonable proxy for job experience and skills, and experience commands higher pay. Households headed by older people have been accumulating wealth longer. There is a skew towards wealth being held by older folks, which should be the case if a society is producing wealth. This makes cross age wealth comparisons dubious at best – it’s best to compare relative wealth within peer groups. Hence the calculator! Always remember one inevitable fact: people get older. The households with 18-24 year olds heading them will eventually be headed by 60-64 year olds, with additional (or different) household members. Since you can’t relive past years, cross-age comparisons don’t make as much sense. Your 35 year old self can’t accumulate for 25 year old you. However, you can save for you at 38. We suggest keeping an eye on relative wealth among your peers, or wealth between adjacent age groups. Good luck with your wealth accumulation! You must be counting the several billionaires. Try leavin out the top 1%. I’m not sure what you mean – yes, there are billionaire datapoints in the data. There are also six datapoints left out by the Federal Reserve, presumably easily identifiable people. Does Net Worth include NPV of social security and/or pension? No, the figures strictly include assets and debts. We might build a model eventually, but won’t add it to this post. Love this data! Good job. Thanks great data and layout. Do you ever break out and publish debt to asset data? Not exactly, but we do plan a post which will try to break down asset and debt allocations per percentile. You could then aggregate the categories you choose to get a ratio. I don’t have an ETA on that post, but it’s currently in the works. Thanks. Enjoy your site. Great info well presented. Thank you. Do you have any explanation why the average net wealth of 18-24 is 2.5x the wealth of 25-29? I don’t, my apologies. A possible hypothesis might be though: some households forming before 25 forego the expense of college, which is rather expensive early in life. If there is enough demand I could try to dig in more to the gap, but the resolution is limited if we try to add too many variables to the mix. 1% of age 18-24 have over 1 million in 2016. In the 2013 data it only took 400k. Perhaps the data is skewed, or a rise in trust fund kids? Am I running this right? Results ==> Top 1%..lower range at $14.7 million. Yes, you’re using the tool correctly. Note again that the true “1% dollar amount” has a lot of uncertainty around it, so it isn’t exactly $14.7 million – but it’s in the ballpark. There’s a pretty huge step up taken in the average wealth between 40 and 60. I’d be interested in knowing how much of this step up was due to being in “prime working years” -being able to sock away more- and how much was due to that age range being the typical time of inheritance. Not sure if the data exists, but something along the lines of “what percentage of total assets are from inheritance, broken down by age”.